Hello everyone! Today I'd like to share a 7 Gypsies Shadowbox Tray that I created for Simply Renee Inc. using Bo Bunny's Gabrielle collection. The tray originally comes in a wood stain color, but I 'whitewashed' it to coordinate with the papers. The large flower was hand-made and all of the chipboard elements, including this baroque corner (DA0543), are manufactured by The Dusty Attic. Most of the flowers used for this project are either made by Prima or hand-made. The photos are of my children several years ago. They are very close and I am so grateful for that. I love how content they look in these photos. This chipboard element (Vine Flourish DA0485) was inked, painted and decorated with white embossing powder. For a tutorial on how I altered this chippie, click HERE. The title is made up of Thickers foam alphabet stickers that were inked and covered with Stickles. In one of the narrower sections, I punched a border and added hand-stitching for texture. In the section beside it, I laced tulle through holes that I drilled through the tray. I am truly blessed to have such wonderful children, and as the journaling reads, I couldn't have asked for anything more perfect. Hugs for kids! beautiful box! Love the attention to detail--so many little details to look at & admire...and the photos of course, tell so much just by themselves. Fabulous work! 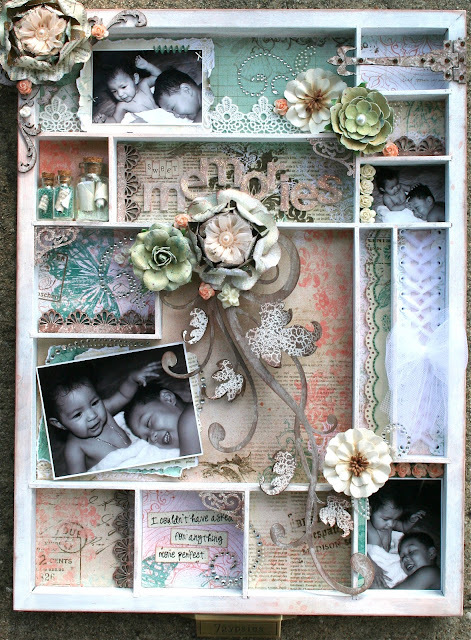 this shadowbox is beautiful, love all the embellishments you have added to it. Beautiful tray! What a treasure! What a BEAUTIFUL shadow box. Your work is absolutely incredible. I so enjoy the days when you post something on your blog! What a beautiful piece for them when they get older ...to pass on...such wonderful heartfelt journaling to them! There is nothing like a mother's love!! I have never tried a tray alteration but this is definitely amazing! Man, is this ever stunning! I think this may be about the most amazing and beautiful printer's tray project I have ever seen, Natasha!